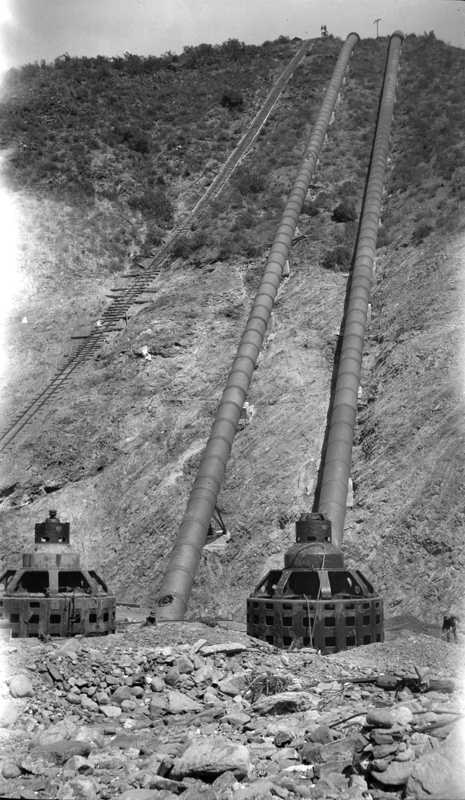 SCVHistory.com DI2809 | St. Francis Dam Disaster | Power House No. 2 Reconstruction: Naked Generators & Penstocks, 1928. Two men, presumably from the L.A. City Bureau of Power and Light (DWP predecessor), are digging through the rubble around the generators that were left behind after the St. Francis Dam failed on March 12-13, 1928. The generators, which produce electricity along L.A.'s gravity-fed water delivery system, are supposed to have a big building around them (this one), but it has washed away. Here is an even earlier post-disaster photo of the generators, still shooting out water. This is what the generators are supposed to look like. Also left behind were the penstocks that fed water to the generators and the dinky rail line that carried supplies up and down in carts. DI2809: 9600 dpi jpeg from original 4x6-inch transparency purchased 2015 by Sharon Divis.